So, what exactly is Ethereum (ETH)? For new digital currency investors, this is a very important question. Maybe you're asking it because you've already heard about the world's second-most famous digital currency. 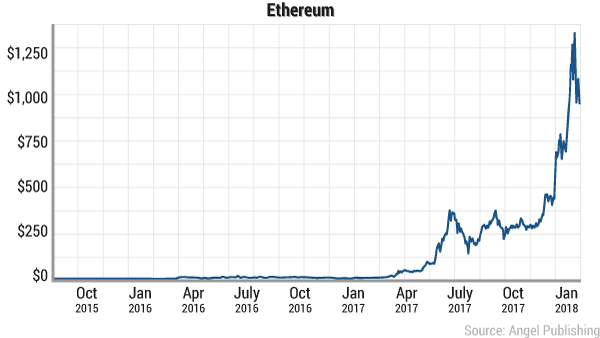 And maybe, like many interested investors, you're wondering how Ethereum has managed to climb the price ladder, moving from $44 to over $1,000 within just one year. Ethereum started to generate buzz at the start of 2017. To many people, those gains are all that matter. Those are the people who regard Ethereum as just another digital currency — even if that's far from true. Over the course of this report, we look at what makes Ethereum unique, its founder, its initial coin offering (ICO), and what other factors could make the digital currency a valuable investment down the road. 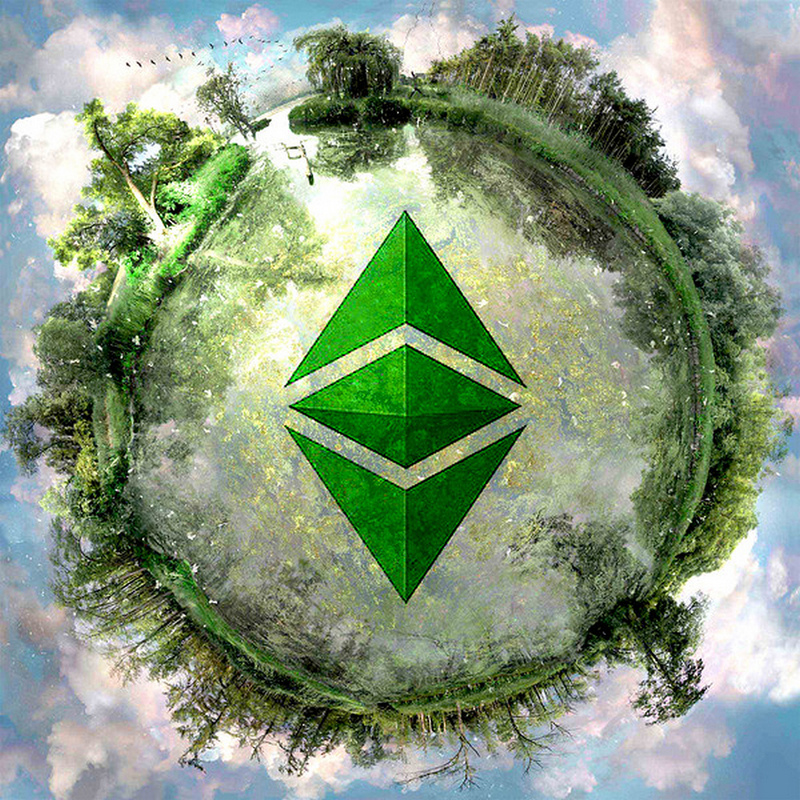 Put simply, Ethereum is a decentralized platform that permits developers to build something called decentralized applications (DApps). A DApp built on the Ethereum network doesn't need a middleman to operate. The blockchain does the work by cutting resources and reducing costs. At this point, it's worth noting that people can also build things on the Bitcoin blockchain. That being said, the Ethereum blockchain has one key advantage that gives it a leg up on the competition. The Ethereum platform is capable of executing something called a "smart contract." A smart contract is a set of parameters in the code. For an action to take place, these parameters need to be met. It also makes sure that a transaction can be secure for both parties because money will only move if the parameters are met. Basically, if one person doesn’t fulfill their end of the deal, the money remains in the smart contract. It can then be returned to the original sender without issue. Here's a simple example: Say you want to send money to a friend who's traveling internationally, but you only want to send that money if the amount in their bank account dips below a certain number. If a smart contract is placed in the code to dictate those parameters, you would only send your friend money if the amount in their bank account dips below the amount you set. This makes smart contracts an invaluable tool to dozens of industries, ranging from finance to health care. Finance companies, like Bank of America, could use this kind of technology to ensure that mortgage payments and other loans are paid. Real estate could use this technology for title transfers, making sure that a house title only transfers hands if the demands of both parties are met. Smart contracts can be used in a wide range of applications, some of which we see in the booming digital currency market. The Ethereum platform allows for the things built on it to be programmed without the chance of fraud, censorship, and third-party interference. The Ethereum platform has a native currency that acts as "gas" for the transactions that take place on the network. This native currency is called ether, and it's what investors are actually buying. You don't really have to worry about the names because Ethereum and ether are used interchangeably by most media outlets. Ether is the digital currency that's native to the Ethereum network. It was never intended to act as a digital currency, even though it's quite effective at this task. As I'm writing this report, ether transactions take two minutes. That's very quick when you compare it to Bitcoin's 10-minute transaction time. Ether was meant to serve as "fuel" to the DApps built on the Ethereum network. This may be mind-blowing for some people, primarily those unfamiliar with the ways in which digital assets function within designated frameworks. Basically, you can think of it like this: Every action that takes place on the network requires ether to facilitate the transaction. You can think of ether like "fuel." Ether fees are calculated based on how much ether an action demands. This is why ether, unlike bitcoins, is not finite. While there can only ever be 21 million bitcoins in existence, there is no limit on how much ether coins can exist. This makes ether less like a store of value or "digital gold" — a phrase commonly applied to Bitcoin. As I'm writing this resource page, Ethereum is still using a transaction-validation method called proof of work (PoW). Ethereum's founder, Vitalik Buterin, has spoken about plans to move away from the PoW model of Ethereum production. Eventually, the young programmer wants Ethereum to move over to something called proof of stake (PoS). PoS is far less energy-intensive and will eliminate miners from the equation. Instead, the transactions on the network will be confirmed by a group of validators. Each validator must hold a certain amount of ether (Buterin has suggested the sum may be around 1,000 ether) to participate in the network. The validator must then put down a stake — portion — of their ether. The more ether they stake, the more money that individual will make from validating transactions. While they can make money for validating transactions, they can also be penalized for bad or malicious behavior. If a validator does something dishonest or forges a transaction, they could lose all the ether that they have. The network is maintained through distributed consensus. The PoS model will help Ethereum in functioning within a global economy, effectively removing miners from the equation. Miners have been a major issue for the Bitcoin network, driving decisions like those surrounding the controversial SegWit2x decision. PoS will also transform Ethereum into a sustainable digital currency. Currently, mining digital currencies through the PoW method consumes as much power as the entire nation of Iceland does. This makes the PoW model largely unsustainable. There are tentative goals in place to have Ethereum adopt PoS by the end of 2018, but it’s uncertain whether that timeline will be met or not. Ethereum was founded by Vitalik Buterin, a then 19-year-old web developer and Bitcoin enthusiast from Toronto, Canada. Buterin had been heavily involved with the Bitcoin community since 2011. His dad had introduced him to Bitcoin when he was 17. After that, Vitalik worked with the digital currency before cofounding Bitcoin Magazine in 2012. As a developer, Buterin quickly grew frustrated with the challenges he faced when trying to code on the Bitcoin blockchain. So, he proposed Ethereum in 2013 as a remedy to many of those underlying issues. Shortly after proposing the idea of Ethereum, Buterin partnered with Dr. Gavin Wood to make the idea a reality. Wood became the cofounder of Ethereum and would stay with the Ethereum team until 2016 before departing to found many other blockchain-based ventures, including ConsenSys. Ethereum's token, ether, was distributed to the public through a crowd sale (an ICO) in 2014. By the end of the crowd sale, just over $60 million ether tokens had been distributed. The team collected over 31,000 bitcoins. In 2016, seven members of Ethereum’s team, led by Vitalik Buterin, made the decision to hard fork the Ethereum code. This decision came after a hack that had compromised a large sum of Ethereum investor funds. At the time, the Ethereum network was acting as the backbone of an ambitious project called the decentralized autonomous organization (DAO). The goal of the DAO was simple: Build a decentralized venture capital platform that eliminated the need for brokerages and venture capital companies, granting the individual the power to invest through smart contracts. Then the DAO got hacked. On June 17th, that hacker was able to scoop up a large sum of investor funds. Long story short, Vitalik’s sect of the Ethereum team decided that the hard fork was the best route to reclaim investor funds. Though needed, this choice was met with resistance from the rest of the Ethereum community. Ethereum was forked into two separate tokens, and the modified token is the version of Ethereum that has gained mainstream media traction today. The other fork was renamed Ethereum Classic (ETC). After the fork decision, it managed to collect a loyal group of followers committed to Ethereum’s original decentralized mission: that under no condition should code on a decentralized platform be interfered with. In March 2017, the Enterprise Ethereum Alliance (EEA) formed to advance the Ethereum blockchain. This alliance is continually growing, with more and more companies applying for membership. 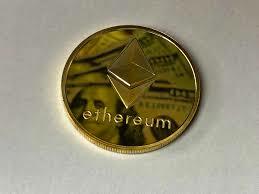 Outside the corporate support, Ethereum has also managed to garner a wide investor base, which has allowed it to creep closer to Bitcoin's tremendous market cap. When it comes to development, multiple blockchain-based companies are working with the Ethereum network. Some of the more notable digital currency projects on the market that are using the network include Gnosis, Populous, Storj, Bancor, and Golem. In the coming year, Ethereum is poised for many changes that could have an impact on its function and assist with its widespread adoption in the corporate space.